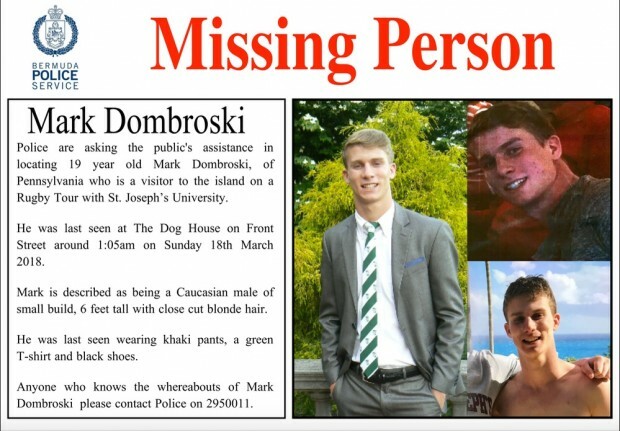 The Royal Bermuda Regiment and the Bermuda Police Service are actively searching for American college student Mark Dombroski, who has not been seen since approximately 1.00am on Sunday morning. Speaking at a press conference this afternoon, Acting Assistant Commissioner of Police James Howard said, “The Bermuda Police Service [BPS] is conducting a full investigation into the disappearance of 19 year old American visitor Mark Dombroski. Mark is a freshman student at St. Joseph’s University in Pennsylvania U.S.A.
“Mark, is a member of St. Joseph’s University rugby team, that came to the island on Thursday, March 15th to compete in the 2018 Ariel Re Bermuda International 7s Rugby Tournament. There were 20 teams, both local and overseas, competing. “The tournament finished on Saturday afternoon [March 17th]. It then appears that Mark along with friends and family went out to socialise. “The last time he was seen by his family and friends was a few minutes after 12am Sunday, March 18th at The Dog House [a local restaurant and bar] on Front Street in the City of Hamilton. “At 9:39am Sunday, March 18th police were officially notified of his disappearance by a family member. Police enacted their missing person protocols and commenced trying to locate Mark, including a concerted media and social media campaign, which saw updates throughout the day and night. “As part of the investigation police are conducting an extensive review of the island wide CCTV network in order to ascertain his movements, if possible. “Police can confirm that CCTV footage now indicates that Mark was seen alone at 1:09am Sunday, March 18th walking east along Front Street just past the junction with King Street. He was wearing a green T-shirt, khaki pants and black shoes. He appeared to be using a cell phone device. “The latest indication so far is that at 1:15am he was seen walking east on Middle Road, Devonshire near Shelton Road. “A coordinated search is being done. Areas of East Broadway and Crow Lane have been checked. “The BPS Marine Unit have scoured Hamilton harbour. The police, his family and members of the community have searched the environs of the City including restaurants, bars and hotels – all with negative results. “We continue to search specific areas as information develops. “The Bermuda Police Service is working with local and overseas partners to advance the matter, with the primary goal to locate Mark as soon as possible. “The Bermuda Police Service is aware of the high level of interest in this matter and appreciates all the assistance that is being offered. We are aware of the efforts on social media and thank members of the public for their interest and assistance. “We urge though, that all search activity be coordinated through the police to capture all information accurately and to avoid duplication of efforts. There is an investigative process being followed and we request the cooperation of the public in this regard. “We are developing a community strategy that will identify key ways the community can mobilise and assist with the search for Mark. “Anybody with information that may assist us in locating Mark is urged to contact police. “In particular, persons that may have personal security cameras in the Middle Road, Devonshire area that may have captured activity around 1:15am Sunday, March 18th are asked to review their footage for anything that may assist police. Mark’s family is on the island and his mother Lisa Dombroski said, “My son, my wonderful son, my cherished son, Mark Dombrowski, is a member of the St. Joe’s University rugby team. He’s a freshman. He’s 19 years old. He was participating in a rugby tournament here. Please contact police on the numbers mention above, or on 295-0011 if you have any information, and for our ongoing live updates please click here. To the family of this young man. My heart is heavy as a mother myself, I am praying for all of you. This is tragic. My main observation is why didn’t the police start this search at first light? I hope this young man is sound safe and sound. What a tragedy. His parents are devastated. It is so sad when something like this happens! Prayers go out to his family from the Bermuda population. What a sad ending to a young person’s life. SAD TO LEARN OF YOUR LOSS. I WILL PRAY FOR YOU AND YOUR FAMILY.